Drafting tables provide a sturdy work surface for a multitude of professions and hobbies. From engineers and architects to artists and craftsmen, a drafting table is an irreplaceable piece. Whether you’re drawing, reading, or composing plans, work is made easy with all the functional features a drafting table has to offer. This Designmaster Drafting table by Alvin features a 37” table height that is adjustable from 0° to 45°, so you can work sitting or standing, and find the most comfortable position. The table is constructed with 18 gauge steel tubing (instead of prep-fab sheet steel), and the legs are welded together to form 3” x 2” posts that create lasting durability and support. An electro-static powder coat in a medium gray finish laminates all metal parts providing a strong and scratch resistant surface. White matte, therma-fuse Melamine makes up the table top board and collateral panels to ensure a smooth yet sturdy covering, trimmed with black vinyl edges to add a sleek look. This drafting table also features two drawers, a locking drawer for tools that is 23"l x 8"w x 3½"d in size, and a 23"l x 31"w x 1½"d reference drawer to store and organize all your papers while keeping them close at hand. 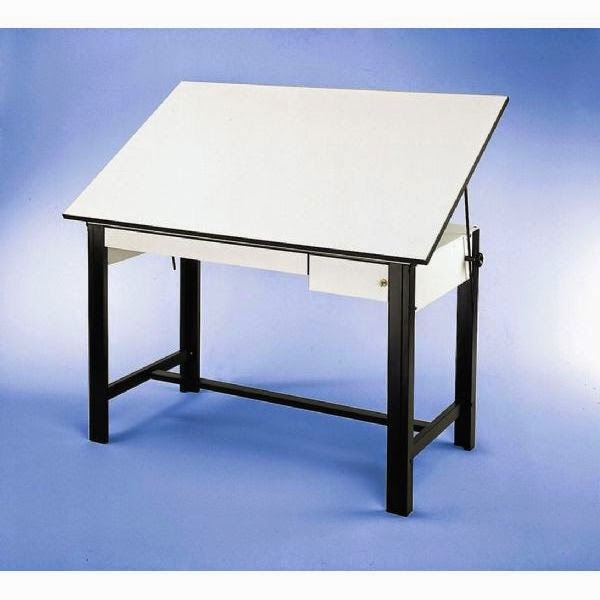 Without out doubt this drafting table is versatile and practical, providing you with a more comfortable and productive work space. Try less stress, try the best, try a Designmaster drafting table.